Re: The Dungeoning - Alpha Demo Now Available! The shadows being cast from your blocks makes no sense. Hey I just dropped in to say progress is going well on the game, I've been working constantly to add and refine features, including more level variations, monsters and weapons. Here is a screenshot showing the new widescreen aspect. Pretty cool, love the lights and colors. The controls take a little getting used to, is the E key supposed to bring something up? Because it shows some kind of room you can resize and stuff. New version of the alpha demo! Get v0.5 here. Lots of new stuff and fixes. Cool game so far! I like the similarities to Demon's/Dark Souls. I recorded a pretty long playthrough of some later levels, I hadn't leveled up my character quite enough to be able to handle this so I do struggle quite a bit. Hope you like how it's looking, let me know what you think! Really enjoying the latest version quite a bit. Sorry if you've mentioned this already, but am I correct in assuming there'll be some music in the final version? If so, what sort of stuff do you have in mind? I'm imagining something the polar opposite of Mos, but I may be wrong. Do you plan on selling this or releasing it as freeware? Is there a Greenlight page or anything? Cool. I'll definitely buy it. This is starting to look kickass! Played the demo, super fun and graphics were slick! Just so you know, I got stuck after I jumped into a hole in level two. The walls were too high for me to jump out and it was a dead end. I feel like I’ve not been doing enough dev-logging on here Problem is I always forget what I have added to the game, so I’m looking back at my commit logs (from when I check files into source control) to see what I did. I’ll try to do this every week or so. Handles selecting random track for each level while avoiding the last track played. Handles queueing tracks and fading them out when switching to another track. Tweaked fire effect, it now starts off a little blue coloured like real flames and spits out the odd ember. 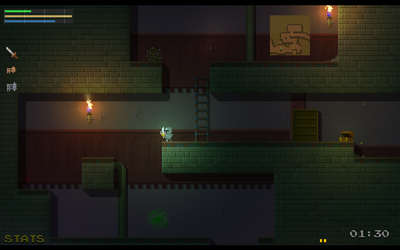 Added decal system so i can paint blood splats, explosion damage, slime splats etc on walls dynamically. Fixed it later so they can’t be placed too near existing ones - the slimes were making a total mess of the place. Next up I want to sit down and write up a big list of everything still to be done, the game is at the tricky stage where there are many loose ends that need tied off, polished etc. This has quite a lot of changes, once again. Anything that would stop you checking it out?